NEWPORT NEWS, Va., Sept. 14, 2012 (GLOBE NEWSWIRE) -- Huntington Ingalls Industries (NYSE:HII) announced today that its Newport News Shipbuilding (NNS) division hosted Chief of Naval Operations Adm. Jonathan W. Greenert for a tour of the shipyard. Greenert received a briefing on the shipyard's current work and capabilities and met with shipbuilders. The admiral also toured the aircraft carrier Gerald R. Ford (CVN 78) to see the progress being made on the first-of-class ship and the advancements in shipbuilding enabled by 3-D modeling and design/build strategies. NNS presented the design changes and industry-leading technologies on Ford, enabling significant total ownership cost savings over the ship's life. 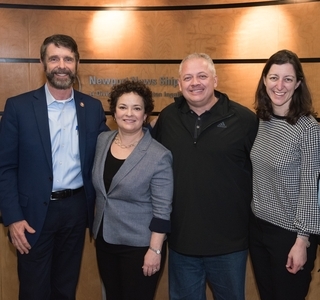 "I was impressed by the advancements on the newest aircraft carrier, the Gerald R. Ford, and the simulation and planning work being done at the shipyard," Greenert said. 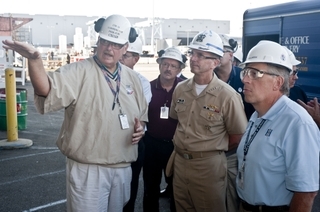 "I met with many proud shipbuilders who keep our Navy running. Special thanks for your dedicated support. We couldn't do our jobs without you!" 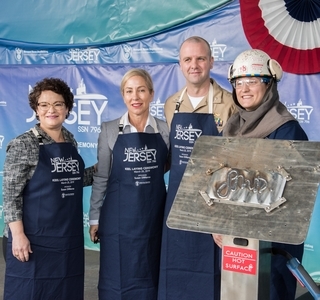 NNS President Matt Mulherin said, "It's an exciting time in the shipyard, and we are pleased that Admiral Greenert had the opportunity to visit with some of our shipbuilders, tour the aircraft carrier Gerald R. Ford and experience all of our progress first-hand. We welcome visits from our Navy customers and take pride in demonstrating our work and accomplishments. These types of visits foster an open dialogue and improve understanding of our joint opportunities and challenges across the board."